After a day of preparation at our secret HQ, and a week of searching for outfits we were ready to go. We figured we wouldn’t need to invite the police as they are already on our mailing list, so attendance was guaranteed to be good. 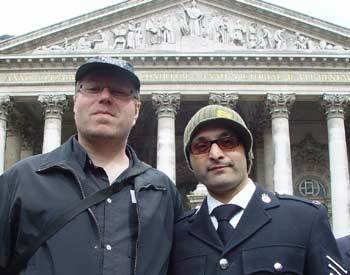 A few of our agents met up in our HQ beforehand and then travelled down to the Bank Of England together, adjusting our outfits to ensure we looked the part. Arriving at the tube station we found a number of officers at the gates of the tube, to whom of course we doffed our helmets. However it wasn’t until reaching above ground that we realised just how popular our party was going to be. 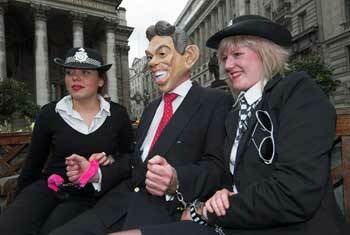 We stepped out of Bank station and into a road with 6 riot vans parked up full of police eager to come to the party. Around the corner dozens of officers lined the streets looking at the bank, and waiting for the party to get started. 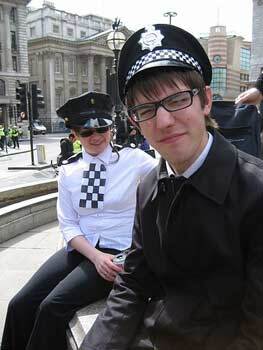 We recognised the faces of several Space Hijacker agents in uniform, hovering amongst the Metropolitan Police. 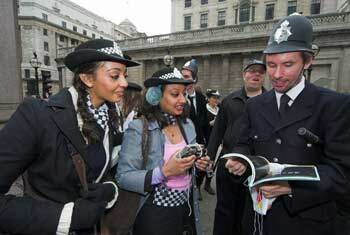 Luckily we had come prepared to entertain the troops, and had spent the last week compiling a play list of police themed music. Within a few moments our sound system plugged in and blaring out the hits. 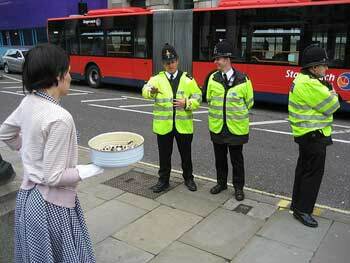 Secret agent Bicycle Girl arrived with a spread of police cakes and started dishing them out to the ladies and gentlemen in uniform. 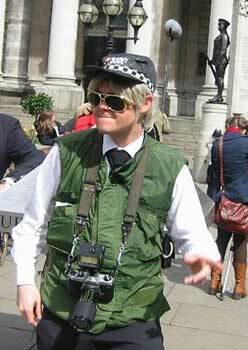 Agent Greenman had come as his alter ego Russ Vandeberg who in turn was posing as a police photographer, with a slightly sleazy eye for the WPC’s. Although as it turned out he was not the only photographer with an eye for the ladies. 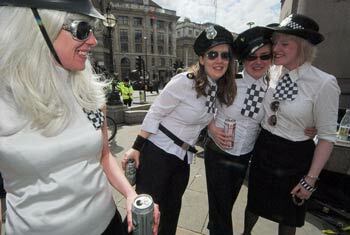 A mob of press photographers had turned up and were spending their time snapping away at our female officers. However it seemed there were several officers hovering around the edges of the party less eager to join in the mayday festivities. They tended to have better uniforms than the rest of us, and grumpier faces. 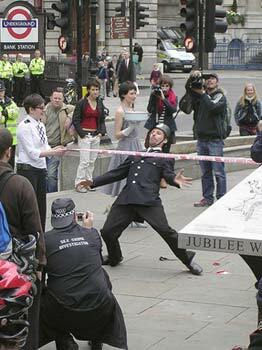 In an attempt to encourage them to join in we had prepared a number of mayday style police games. The first was a variation on the old classic, pin the tail on the donkey. 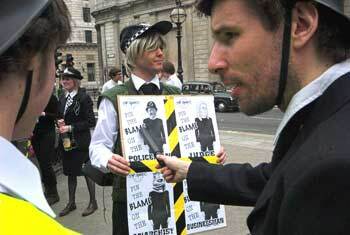 Our police twist was to turn it into “Pin the blame on the anarchist” Officers were spun around with their eyes closed and asked to stick their pin in the anarchist. Unfortunately due to the dizziness most officers who tried ended up pinning the blame on judges, businessmen and even the police! Time for a quick game change. Next up was a modern styled pinata. We had spent the last week making two paper mache black bloc protestors full of sweets. This seemed to get the officers going much better. 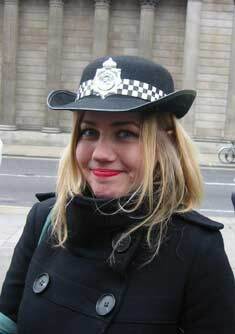 No sooner had we pulled one out, than a rain of truncheons fell upon it, bursting sweets all over the streets.